P 80 is a new very prolific pleurotus-hybrid which produces heavy fruit-bodies with a dark-grey to brown colour and an excellent taste. The first flush can be harvested 28 days after spawning. P 80 produces oyster-mushrooms with big dense fruiting bodies and a moderate amount of spores. Supplementing before pasteurization is possible, but increases the chance ofi nfection with competitor-moulds. Mixtures of grinded corncobs and alfalfa are able to increase the yield enormously without the risks that are normally seen with more regular supplements. Recommended spawning-rate is 2% of the wet weight, this is 25 to 30 litres of the spawn per tonne wet substrate. Because of low selectivity of the substrate, the spawn has to incubate the substrate as quick as possible. Ideal substrate temperatures are 26 to 28 °C and an air temperature of 20 to 23 °C. An incubation-period of 14 to 16 days is sufficient. If, after 5 days of incubation, the mycelium is still not running into the substrate, there must be some kind of infection or problems of incorrect substrate. After incubation the pin formation is introduced. For this small holes are made in the plastic, or the plastic is removed. The climate in the room is changed and ideal circumstances for information are being created. Optimum values for fructification are: The air temperature is decreased to 16 °C. Substrate-temperature is 1 or 2 degrees higher. By means of humidification (high pressure mist or steam) the relative humidity is kept high (95%). 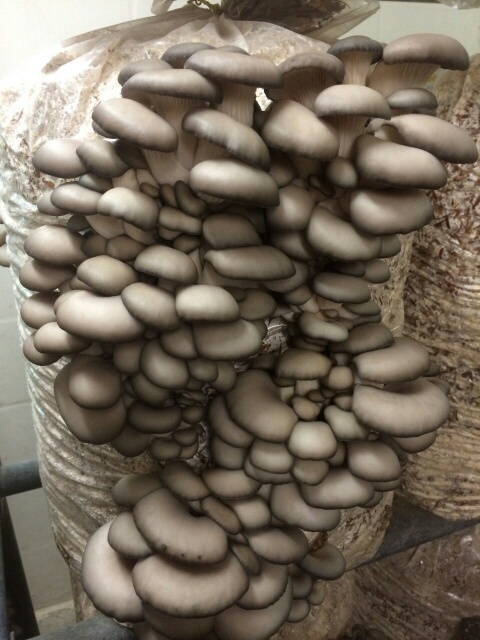 The CO2 -content is kept on 0,10 to 0,15%, in order to decrease the amount of pins per cluster in which the quality of the oyster-mushrooms is improved. Light is essential for a normal development of the fruit bodies. Normally 75 to 100 lux for 12 hours per day is sufficient. More light gives darker oyster mushrooms. Lack of light is visible when the pleurotus develops fruit bodies with a long stem and a small cap. The amount and size of the fruit bodies is depending on the diameter and amount of the holes in the plastic. When the fruit bodies are 1,5 to 2 cm in diameter, relative humidity is lowered to 85 to 90% (depending on the air-velocity) in order to increase the evaporation. When the R.H. is too high during outgrow of the pins, the quality will be worse. Optimum temperature during cultivation is 16 to 17 °C. Temporary higher temperatures are no problem for this strain but will reduce the quality. CO2 -content varies between 600 and 1000 ppm depending on the outside conditions. First flush can be harvested 10 to 12 days after flushing. Yield of the first flush varies normally between 8 and 10% of the wet weight, depending on the quality of the substrate and growing-conditions. After the first flush CO2 and R.H., but also the substrate-temperature, are being raised to introduce a new pin formation phase. After this, decrease the temperature, CO2 and R.H. for the outgrow of the fruit bodies. Generally 3 flushes are being harvested in 6 to 8 production- weeks depending on the cultivation method and the temperature-regime being used.